When floods hit, it’s more than the land that’s washed away. Especially in areas like Pakistan, where livelihoods hang in the balance for its already vulnerable citizens. Once waters settle, the real work lies in rebuilding for everyday survival. Driving through Southern Sindh province in Pakistan on a bright, sunny day in early December 2011, it is difficult to imagine the catastrophic scale of the destruction caused by the floods of 2010. Beyond the bounds of the irrigated sites, the land is now dry and dusty and the heat is immense. As I meet with Concern’s beneficiaries and partner organizations, it is all too clear however, that, although the flood waters have receded, their devastating legacy lingers. In August and September 2010, villages across Jamshoro district were entirely submerged in water. We all recall the media images of the floods in Pakistan, but it is often difficult to fully comprehend the extent and reality of the devastating impact until you speak with those who were directly affected. Imagine losing everything you ever possessed; imagine fleeing your home with your children to save your lives; imagine watching as the mud walls and thatch roof of your home and business disintegrate in the floodwaters before your eyes. Bakhtwar Parhar was born healthy, but, at six years old, she contracted polio, which left her severely disabled. She is no longer able to stand upright and can only walk in a squatted position using her hands to support and leverage herself. As the flood waters continued to rise, Bakhtwar was evacuated by boat to higher ground with her family, where they stayed in a makeshift camp for two months, while her village lay submerged in water. When she returned, everything had been washed away: homes, small businesses, livestock. With great determination, Bakhtwar, with the help of her sons, began to rebuild their home and her convenience store, which had supported the family prior to the floods. With her husband elderly and unable to work, the family was entirely dependent on this income to get by. 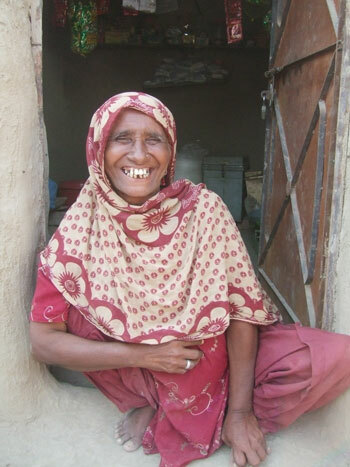 Bakhtwar came in contact with Concern through our partner organization, Pakistan Fisherfolk Forum (PFF), who learned of her extreme poverty and particular vulnerability given her disability. She was subsequently selected to receive a cash grant that enabled her to re-establish her micro-enterprise and start earning a living again to support her family. Concern provided Bakhtwar with a grant of PKR 20,000 ($220), which she used to finalize the construction of the shop and purchase stock. She now earns approximately PKR 200 ($2.20) per day – an amount that covers their basic household expenses, plus a little on the side for transport to medical treatment in the nearest town, 40 km away. Bakhtwar is one of those people you feel privileged to meet. She is full of determination and hope; she is resilient and energetic; she is inspirational. I couldn’t help but wonder how many of us would cope so remarkably at losing everything we owned and being forced to start re-building our lives with nothing. She is one of more than two million people that Concern has supported in the aftermath of the floods. Prior to the disaster, Concern had an emergency response plan in place with pre-selected and trained local partner non-governmental organizations (NGOs), like PFF. Consequently, Concern was able to provide immediate life-saving assistance through partners located in the affected areas and who have extensive knowledge of the local context. This helped make it possible for Concern Pakistan to deliver our largest emergency response ever. In the initial aftermath of the floods, Concern distributed temporary shelters and shelter kits, hygiene kits and basic domestic utensils and equipment and provided immediate access to clean water. However, at 18 months on, the needs that remain are enormous, as the affected communities strive to re-establish their livelihoods. Concern is there, and remains fully committed to supporting these communities so that they can resume some sense of normality and independence in their lives. Concern continues to work with the affected communities in restoring their livelihoods through agriculture and livestock, irrigation repair, trade-specific training and cash grants. Concern has invested considerable time and effort in developing the capacity of our local partners, which was so important in enabling a speedy and effective emergency response to the floods in Pakistan’s four provinces. Our partners have emphasized the “culture of partnership” that exists with Concern and they are appreciative of Concern’s timely support in emergencies, building their emergency response capacity and supporting in developing systems, including those that strengthen their accountably and transparency. In a recent evaluation of Concern’s emergency response to the floods, Concern was found by partners “to be respectful, collaborative and flexible” and referred to Concern as an organization that “allows a true partnership.” The evaluation also highlighted the cost-effectiveness of Concern’s response, which was largely attributed to our partnership approach. This is testament to the ethos of Concern and our commitment to helping those living in extreme poverty, like Bakhtwar and her family, to achieve major improvements in their lives in a sustainable way.